It took me a couple of months, but I finally went back to The Big Egg on a recent food adventure. I wisely chose a weekday to come by. Gail and Elizabeth were busy, but not completely swamped with orders like a weekend probably brings. Still at the Mississippi Marketplace food pod! Since the Monte Cristo was taken off the regular menu, I felt even more inclined to drop by and try something else. 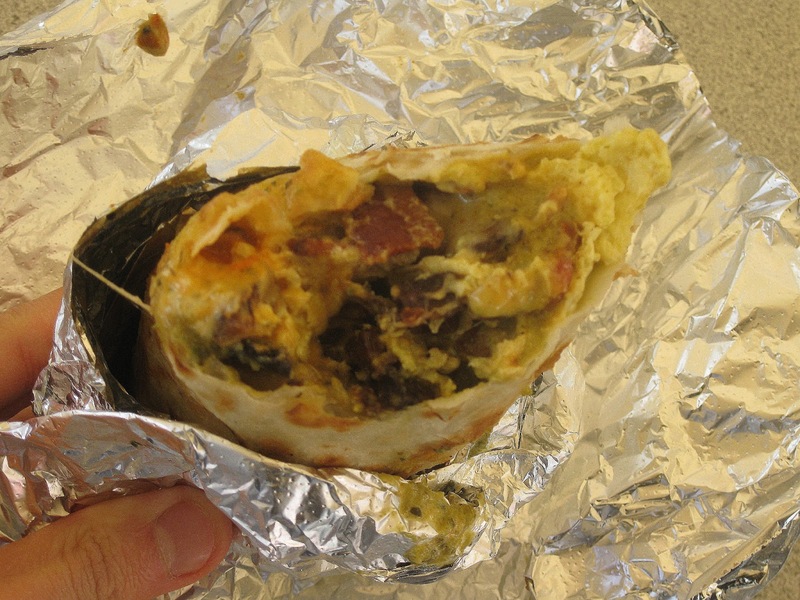 The breakfast wrap ($6.50) has sold out virtually every day, so that was the logical decision this time. Scrambled eggs, grilled potatoes, organic portobello mushrooms, Tillamook white cheddar all in a grilled flour tortilla. Two house-made items: a fire-roasted poblano salsa and a yogurt-lime sauce, united everything. Oh! The bacon! Smoked bacon! Yes! Yes! Yes! Must add. What's that? Sriracha? Do you want to join the party? Add extra sriracha just for the spicy panda. I will make sure the word "pandagasm" starts trending on Twitter. This outstanding wrap is addicting. Whatever holy elixir the salsa, yogurt-lime sauce, and sriracha made just blew me away. Come on, bacon was already delving into the unfair fight realm. And then the ingredients all got together to form "breakfast wrap"-crack. A perfectly heated tortilla remained pliable, with patches of light brown freckling that surface. No wonder the wraps sell out all the time. Now that I know better, I'd consider ordering more than one at a time. Especially in this case, there's nothing wrong with stuffing your face and getting a deep food coma! You can also get Tapatio instead of sriracha, just FYI. But the spicy panda likes to take a shot of sriracha every now and then, so that pretty much won by default. I should just bring my own ghost pepper powder to every food cart. 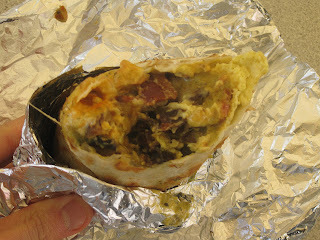 Right now, I can only imagine the ensuing bliss if The Big Egg's breakfast wrap met evilly awesome bhut jolokia. Their current seasonal special sandwich uses house-made rhubarb-apple butter and fresh English lavender. Of course, they add smoked bacon and an egg to that one.